Having pumped water up against the Chilean dam last week, and found it equal to the pressure, Australia entered this match not knowing exactly how much their opponents could resist. Would this be another vain effort, chance after chance missed or denied, ending in frustration? A 17-minute stretch in the second half showed that the Chilean resistance had a spectacular breaking point that Australia were easily able to reach. 5-0 it ended, in front of a packed Newcastle crowd, and the Matildas’ confidence in their ability to break down a stolid opponent will be restored. Laura Alleway, whose errant backpass allowed the visitors to equalise in Penrith, was dropped to the bench with Alanna Kennedy coming in at centre back. Lisa de Vanna was also rotated to the bench, and Mackenzie Arnold replaced Lydia Williams in goal. Gema Simon was started at left back, with Elise Kellond-Knight shifted in the midfield, versatile player that she is. While Alen Stajic was clearly turning his squad with these changes like a gardener would a loamy patch with a hoe, this was no breezy friendly, not after the defeat last week. Obviously, Sam Kerr started; her wayward finishing in the first match will have irritated her, a player for whom goals are scored with as much professional satisfaction as a butcher takes in cleaving through a bit of fresh carcass. Chile were spirited, and were able to hold the ball in the early stanzas, winning a number of fouls. As Australia eventually assumed the attacking impetus, the South Americans settled back into a compact, narrow block, sitting very deep and looking to break at speed. This was the anticipated system. After 20 minutes, Carpenter burned her defender, raced toward the byline, and sent an ideal cross in toward the far post, but Chloe Logarzo headed over unmarked. Chile put together a string of corners, good pressure applied on their hosts. Daniela Zamora forced a sharp save from Arnold at her near post after scorching past Polinghorne, cutting inside and snapping a shot off. The chance came from a straight line drive, a vertical pass puncturing through the Matildas defence; possession wasn’t particularly unevenly split in the first half, but Chile had hit nearly three times as many long passes as the Matildas. They were right to, as it was during these direct raids that the Australian defence looked most shaky. Kennedy, towering over every Chilean outfielder, nodded a header onto the base of Christiane Elder’s post. 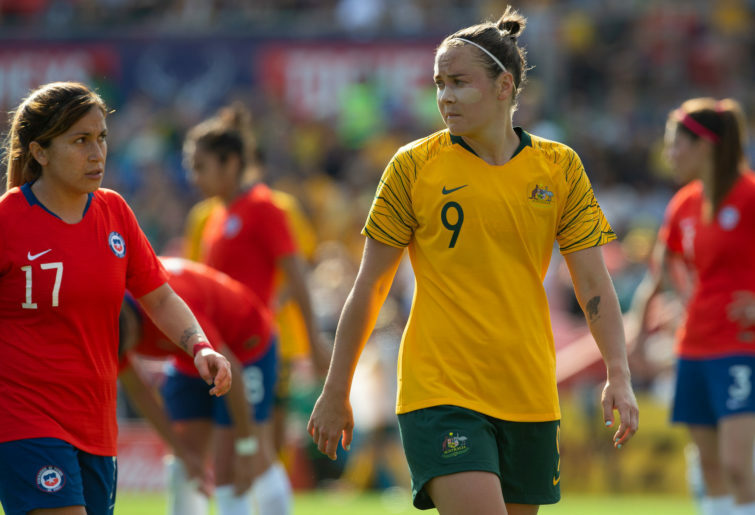 The Matildas were getting frustrated as the first half ended; gameswomanship, time-wasting, a particularly hard foul on Kerr, it was all niggling visibly at the green and gold patience. Their frustration was grossly manifested in Caitlin Foord’s flashing elbow, flicked into the chin of a marker at a corner. It was not a nice moment, and she was fortunate the VAR was not in place because she would have been sent off. As the halftime whistle sounded, it was 0-0. Kerr was being marked tightly, with a dedicated shadow tagging her at all times. Her ability to contribute in spite of this tremendous pressure is excellent; dashing into space between the midfield and the attack, her velvet touch kills even the most stoutly-hit pass, and her ability to lay off to runners is as impressive. Still, it meant she was often behind the play for which she had acted as the original catalyst. Ideally, Kerr is to be the finisher, not the progenitor. As soon as Kerr got an opportunity to run ahead of the play, she put Australia in front. A counter-counter, so to speak, was the method. Chile sent players forward with the sniff of a counter-attack in the air, and when it broke down, Foord was steaming at a trio of terrified Chilean defenders. She laid on a perfect pass for the streaking Kerr, who finished through Elder. And then, two minutes later, Foord scored Australia’s second. 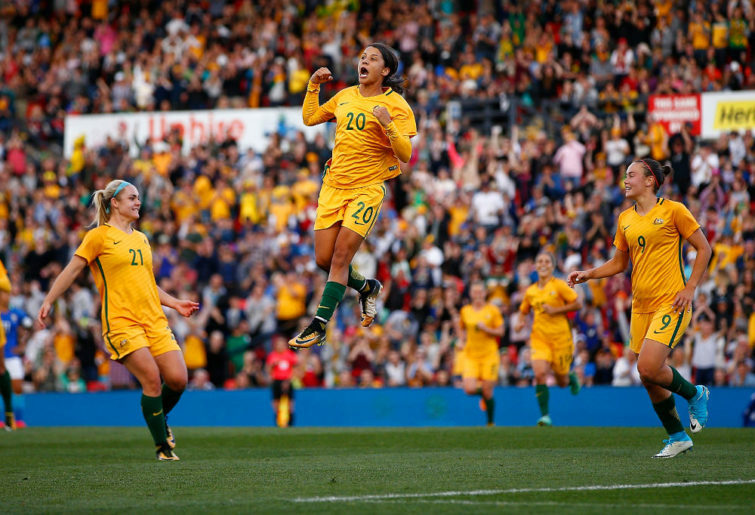 Like a shark with blood in the water, the Matildas were powering forward, desperate to take another bite. Worked neatly around on the left by Emily van Egmond and Logarzo, the latter crossed. Kerr’s backheeled flick attempt didn’t stick, but the ball ran all the way through to Foord at the far post, who had a postage stamp-sized spot through which to place her shot. She so placed it, a two-minute double-salvo, and the home side had the teeth sunk in, with their opponents lifeless and dangling. A flurry of opportunities with Kerr at the heart of all of them came, one after another, as Australia revelled in the open floodgates; finally, the pressure had told, and the chances were tumbling out of the game now, with half an hour remaining. The Aussies’ superior conditioning was showing through, as the mental toll of conceding intensified the sear of lactic acid in the Chilean leg and prod of the icy dagger in the Chilean lung. Foord plundered another. Christiane Endler, so accomplished and composed, had a heavy touch jar off her boot, and Foord was onto it in a flash. Bouncing a Chilean defender off her hip, Foord assumed control, and lifted the ball over Endler on the edge of the box. 3-0. Emily Gielnik, a substitute, smashed in a fourth, a left-footed shot from the left-hand side of the box that speared past Endler, and nestled in the bottom corner. Logarzo had sent Gielnik clean through with a neat outside-of-the-boot pass, and Gielnik was unerring in her finish, a beauty. 4-0 now, and Australia were savaging an opponent who, perhaps, had thought they had had their number. Foord gobbled up her hat-trick goal, tapping in her country’s fifth from close range after Carpenter’s super run and cross. Foord had been unplayable in the second half. This was, in truth, a scoreline more representative of the gap between these teams, both in the FIFA rankings and on the park. The loss last week was a costly aberration, and although the effect it may have on the World Cup draw cannot now be rectified, this trouncing win was the ideal way for Australia to reassert their supremacy.